Emails have come a long way from merely typing and hitting send fiesta to an advanced friend that makes mailing a breeze. While the benefit of communicating with your loved ones or corporate connection beyond geographical barriers appeared to be a miraculous blessing of emails once, there is a wide range of added features that now define emails. You now have sections to take care of important emails, and some that ensure that your mailbox looks spam-free. One of the pioneers in the arena of Emails, Gmail, is all set to celebrate the journey of successful 15 years. And just as the way it loves surprising users with extraordinary offerings, it gets users fun ways to experiment with your inbox. Let’s check out these great features here!!! Imagine being a salesperson who needs to drop a proposal to prospects’ inbox. You get ready with everything you need by midnight. While the excitement to send the proposal is evident to creep in, you also need to respect other party’s time. So you plan to send in early in the morning instead. And that requires you to set the alarm and then wake up at the precise time to send it off. But no more, Gmail gets you scheduled send options. Thus, you can write the message as you usually will and schedule when to send it. Writing email is not as intimidating as writing its subject line. Mail’s body comes later; the first thing is the subject line. If a person will open the mail or not, a lot depends on the same. Understanding this, Gmail now gets you subject line suggestion for you to make email easier. “Smart Compose” will analyze your message to understand the intent and then get you suggested subject lines. All you need to do is, click Tab to accept it (if you want to). So what’s your writing style? Casual? Formal? Regardless of what it is, Gmail has an eye on it, and this will help you give the personal touch to your emails. For example, if you often prefer writing “Hey David,” instead of “Hi David,” Gmail is more likely to come up with suggestions to make the mail appear more like you. Predictive texts on smartphones have been helping users on the smartphone for a long time now. An amazing example can be seen when you write “Good Morning” using your phone’s keyboard. You’ll have the next word, most probably the person you frequently send the wish to, ready for you to hit. Well, Gmail takes this experience to an altogether different level by bringing it as an inherent part of your mobile app. With predictive texts mode on, the app gets you contextual suggestions, for addresses, as well as while you type on the go. You can just swipe right to accept the recommendation. Love for language is the greatest of all. Gmail very well gets it, and so it extends smart compose with predictive texts and suggested phrases in languages like Spanish, French, Italian, and Portuguese. Responding to a Google doc comment thread has always been a tedious task. You get notified via inbox, read the notification, and then navigate to another tab to open the doc link and then finally respond. Not anymore, Gmail has got you covered with dynamic emails. Thus, you can now perform more than just reading the emails within your inbox. Gmail now extends you the liberty to browse through the hotel recommendations, travel deals, submit RSVP, and even schedule appointments or fill up questionnaire right from the email message. 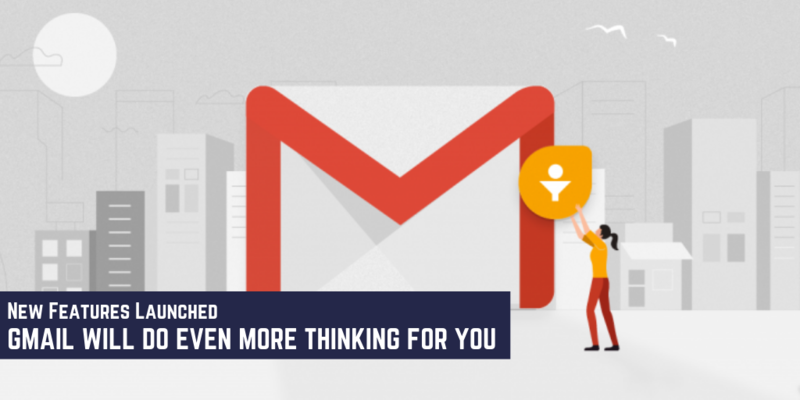 While users gift Gmail successful 15 years of popularity, Matellio thanks them in its own phenomenal way by extending a wide range of benefits to the users. Now that you enjoy those amazing addition on your inbox over smartphone and web, don’t forget to share your experiences helping out other users the way we are doing. ← What is a native app, a web app, and a hybrid app in Android?